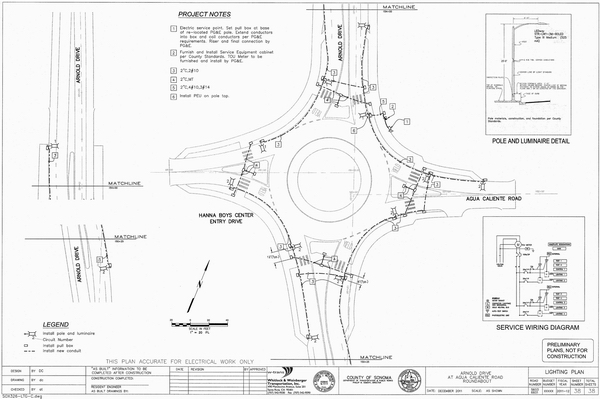 W-Trans assisted with the design plans and specifications for a roundabout at the junction of two arterials in Agua Caliente, located at the transition between rural and suburban Sonoma County. 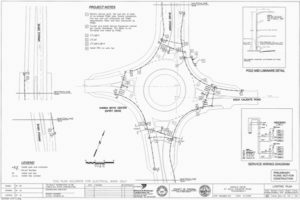 W-Trans was responsible for the horizontal design of the roundabout, roundabout signing and striping plans, electrical plans, traffic handling plans, roundabout traffic analysis, and support on related issues including landscaping design. Key constraints included the need to regulate entering vehicle speeds on Arnold Drive, avoid right-of-way impacts, minimize environmental impacts associated with trees and street lighting, and accommodate a major utility vault outside of the circulating lane. Construction of the roundabout was completed in December 2013.